Storm is a fictional superhero appearing in American comic books published by Marvel Comics. The character was created by writer Len Wein and artist Dave Cockrum, first appearing in Giant-Size X-Men #1. Cockrum's original concept for a character with the power of weather control was of a male. This changed after he realized that multiple females with cat-related abilities, his first idea for a black female hero, had been created and were in development. Descended from a long line of African witch-priestesses, Storm is a member of a fictional subspecies of humans born with superhuman abilities known as mutants. She is able to control the weather and atmosphere and is considered to be one of the most powerful mutants on the planet. Nightcrawler is a fictional superhero appearing in American comic books published by Marvel Comics, commonly in association with the X-Men. Created by writer Len Wein and artist Dave Cockrum, he debuted in the comic book Giant-Size X-Men #1. Beast is a fictional superhero appearing in American comic books published by Marvel Comics and is a founding member of the X-Men. Originally called "The Beast", the character was introduced as a mutant possessing ape-like superhuman physical strength and agility, oversized hands and feet, a genius-level intellect, and otherwise normal appearance and speech. Eventually being referred to simply as "Beast", Hank McCoy underwent progressive physiological transformations, permanently gaining animalistic physical characteristics. These include blue fur, both simian and feline facial features, pointed ears, fangs, and claws. Beast's physical strength and senses increased to even greater levels. The Morlocks are a group of mutant characters appearing in American comic books published by Marvel Comics. The characters are usually depicted as being associated with the X-Men in the Marvel Universe. Created by writer Chris Claremont and artist Paul Smith, they were named after the subterranean race of the same name in H. G. Wells' novel The Time Machine. They first appeared as a group in The Uncanny X-Men #169 ). Caliban appeared prior to that, but he was not yet a member of the Morlocks. Psylocke is a fictional superheroine appearing in American comic books published by Marvel Comics, commonly in association with the X-Men. Created by writer Chris Claremont and artist Herb Trimpe in 1976, she first appeared in the Marvel UK series Captain Britain. Spiral is a fictional supervillain turned superhero appearing in American comic books published by Marvel Comics, commonly in association with Longshot or the X-Men. Created by writer Ann Nocenti and artist Art Adams, the character first appeared in Longshot #1, in which she was established as a lieutenant for that titular character's archenemy, Mojo. Prior to Longshot joining the X-Men, Spiral also became a recurring adversary of that team and each of the various X-Men subgroups, as well as serving as the archenemy turned ally of X-Men member, Psylocke. James Braddock Jr. is a fictional character appearing in American comic books published by Marvel Comics. The elder brother of the twin superheroes Captain Britain and Psylocke, he is a mutant possessing the ability to manipulate reality in a variety of ways. Though his mutant powers are very powerful, he is limited in that he is also a schizophrenic who believes reality to be his own dream. 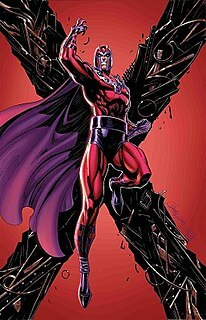 Originally a supporting character in his brother's solo comic book series, the emergence of his superhuman powers and subsequent mental illness have led him to become a super-villain associated with both Captain Britain and various X-Men comics.